It may be that teenagers are deserting Facebook and that their future prospects aren’t as rosy as they were maybe a year ago, but the chart above makes it clear that Facebook is in a much stronger competitor than any of it’s competitors. LinkedIn, Pinterest, Twitter and Instagram are all great businesses that either have their use as marketing channels or soon will do, but Facebook remains the grand-daddy of them all. With the exception of LinkedIn these are all advertising based businesses so think of it this way – if you are targeting all US online adults you will find 70% of your target market on Facebook, and only around 20% on each of the other sites. I’m rather late to this, but this morning I was pointed towards an eMarketer projection of Twitter revenues from March this year which has them hitting $950m in 2014, up from $583m this year. That’s some growth given the scale they are at and explains why people are talking more and more often about Twitter’s IPO. eMarketer puts the growth down to Google and Facebook focusing on mobile, Twitter’s ads API, and the fact that its ads are truly native (i.e. a genuine part of the native user experience). Twitter has 550m active users, so their ARPU is about $1. The takeaway: it takes a lot of users to build a substantial ad based business. I can’t find any information on profits so it’s hard to know what this means for their valuation. Clearly they will need very high net margins to reach the mooted $10bn IPO value. Only 17% of their revenues come from outside of the US. The takeaway: there’s an opportunity to help European advertisers spend more money on Twitter. I have been wondering lately how Twitter was getting on. Anecdotally people and companies seem to be getting more and more out of the site and its data but the chat I’ve heard about the efficacy of its advertising products has largely been negative. Well it turns out the business is doing very well. As you can see from the chart above revenues have now reached a reasonable scale and continue to grow very fast. 100% year-on-year growth for a business of this scale is impressive. Moreover, their star is rising, according to Forbes a year ago eMarketer was forecasting Twitter’s 2014 revenues at $540m, 43% less than the $950m they are now forecasting. Over half of ad revenues are on mobile and an IPO could come next year. 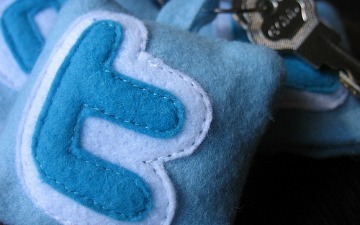 Mashable reported yesterday that Twitter’s self-serve ad platform has gone live. I’m sure there were elements of both these points in Twitter’s decision making, but I’m guessing it is more about the latter. It is true that Twitter has raised a lot of money (including from DFJ) but they are still sensitive to valuation, and revenues are a key driver of valuation. I think the truth of the matter is that self-service ad platforms only work when they are a no-brainer for advertisers – and that means on a platform with a very powerful brand and an easy to understand advertising proposition. Self-service ad platforms are targeted at small businesses and small business owners don’t have the time or understanding to be interested in anything else. In Twitter’s case they have had the brand for a while, but the advertising products haven’t been simple. My main reason in writing this post is that many consumer internet companies plan to build self-service ad platforms relatively early in their lives – i.e. before they meet the criteria of powerful brand and an easy to understand proposition. In the majority of cases they will be better off following Twitter’s example and waiting – even if that means finding an alternative way to drive revenues. I have long been a user of the Topify service which provides email alerts to events on my Twitter account. My primary use case has been to quickly see who has started following me and to efficiently follow some of them back by simply replying to the Topify email. Unfortunately the service is being shut down on August 5th. The email below explains why (highlights mine). Many of the emails we send have X-Twitter* headers in them, with pieces of information about the event which triggered them. You might have noticed we’ve started decommissioning these headers. If Twitter (or any other company) wants third party developers to leverage their platform then they need to offer as much certainty and predictability as they can. Without that rational developers will determine that the risk reward equation isn’t good enough and focus their efforts elsewhere, as Topify is now doing. In this case that is to the detriment of both individual Twitter customers who had been using Topify (like me) and to the ecosystem generally as my levels of engagement will now take a hit. It is unclear to me at this point whether Twitter really sees itself as a platform company or a consumer focused internet service. In light of developments like this it feels more and more like the latter, in which case better notification emails and email based interaction with the service would be high on my list of feature requests. You may have seen the news today that the US anti-trust regulator is making Twitter inquiries. I really hope the world’s favourite short messaging service is exonerated because to me this is crazy. I’m a believer in appropriate regulation and I think anti-trust laws have an important part to play in controlling company behaviour, but their purpose is to prevent abuse of dominant market positions and I don’t think a company should be classed as dominant until it is much bigger in revenue terms than Twitter’s estimated $150m this year, and is making significant profits. Seeking to regulate behaviour before that point will undermine the search for a scalable and profitable business model which isn’t good for the company itself, ecosystem partners or innovation in general. I’m not defending Twitter’s behaviour in the spat with Ubermedia or how they have treated their other ecosystem partners, that is not the point here. The important thing is that many people love Twitter (now running at 200m Tweets per day) and that the company be given the best chance possible to find a way to scale revenues and generate profits so it can keep the service alive and growing. This may seem a little harsh on developers in the Twitter ecosystem, but as mentioned above, ultimately they need Twitter to be successful, and in addition, one would hope that they took the time to understood the risks of building on top of a commercially unstable platform before they became a Twitter partner. You have probably seen the news today that Twitter has acquired Tweetdeck for $40m, ending a month or two of wrangling between Twitter and Ubermedia over the business. As well as being an interesting saga in its own right and a good result for Tweetdeck the whole affair is a good illustration of the perils of being too dependent on a company like Twitter. Dependency on another company is never desirable, but it isn’t necessarily something to worry about too much if the partner is stable and profitable, and the relationship is mutually beneficial – e.g. Zynga is ok on Facebook. However, if the partner has yet to find a stable business model or there is any hint of exploitation then then their policies are subject to change in ways that can undermine their erstwhile partners. Look at the way Twitter’s acquisition of iPhone client Tweetie last year undermined other Twitter iPhone clients and the way Google’s changes to its search algorithm has hurt content farms and other aggregators. Tweetdeck’s exit was pretty decent. At some stage I am sure they were hoping for a bigger outcome, but given they only raised $3.8m I’m sure Ian Dodsworth and his investors have all made good money. I think they were able to achieve this result despite their dependence on Twitter because of the scale they had achieved and because Ubermedia was/is becoming a pain to Twitter and was keen on acquiring Tweetdeck. The latter condition is pretty hard to plan for and needed to be present for Tweetdeck to get the result it did. Ubermedia is run and backed by some very smart people, but from what I know it is now hard to predict great things for the company. They are as dependent on Twitter as Tweetdeck was, but unlike Tweetdeck they obviously felt they needed to fight Twitter to maximise growth, and Twitter has put them in their place both by the Tweetdeck acquisition and by suspending their apps for violating the terms of service. It is hard to see Twitter acquiring them now. This Business Insider article does a good job of detailing Ubermedia’s chequered history. So in summary, of the two Twitter dependent businesses discussed here one achieved a decent result and the other still has an unclear future. That doesn’t sound too bad, but Tweetdeck did very well to build competitive tension around its exit and I’m left thinking the same as I did before I wrote this post, that dependence on companies like Twitter brings risk to a company and is best avoided/mitigated. It is for this reason that Tweetdeck’s strategy was to become a social media dashboard. There was a post on Techcrunch over the weekend titled The walled garden has won. Regular readers will know I’m a big proponent of open systems and hence I read this piece with interest. Regrettably I think the title is accurate, although I don’t think the news is all bad. Firstly the concept of a walled garden has mostly been applied to the web offerings of AOL and mobile operators which gave consumers access to only a limited portion of the web. Carefully curated, but limited. That sort of walled garden has emphatically lost. Not mentioned in the article is the fact that the most open of mobile OS’s Android comes with a cast iron requirement to use Google Maps and Google Search. Finally, I would be remiss if I failed to mention that you can only run Apple approved software on your iPad and iPhone. Last summer I wrote a couple of blog posts about how the web ecosystem is maturing and getting more complicated making it harder for startups to grow to scale without working in partnership with companies like Facebook, Twitter, Google and Apple. I think that is doubly true on mobile where not only is it hard to scale without partnerships a startup remains dependent on its partners for continued prosperity even after it has hit scale. In many ways I would prefer it if the web and mobile web were as open and free as they used to be, largely because that made it easier for startups, but as I wrote above the news that the ecosystem is to an extent controlled by the large players isn’t all bad. With the control comes and ease of use which has massively accelerated usage growth, particularly on the mobile web. This infographic from GigaOM is interesting. As mentioned in the title Facebook and Twitter have a very similar demographic. I was surprised by this at first, but on reflection maybe it is only to be expected – user bases as large as Twitter or Facebook are probably unlikely to deviate much from overall internet usage.